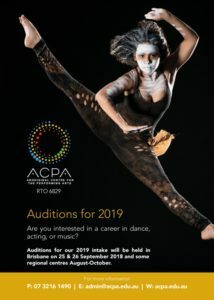 With an average Indigenous completion rate more than 50 percent greater than national figures for Diploma and higher level courses, the Aboriginal Centre for the Performing Arts (ACPA) is expecting record numbers of applicants to audition for its 2019 intake. ACPA CEO, Dr Dimitri Kopanakis, said regular opportunities to perform at major venues and with high-profile artists helps motivate ACPA students to commit to their studies, resulting in a steady retention rate of 80 percent. “With 80 percent of recent graduates continuing on to higher education and 17 percent securing employment in the performing arts and other industries, ACPA is proving to be an attractive option for school leavers,” Dr Kopanakis said. “University isn’t an option for everyone, and we offer an accessible, affordable alternative for talented school leavers who want to find a career path for their creativity. “What makes ACPA a popular choice and truly unique is that we’re the only Registered Training Organisation in Australia offering nationally accredited courses that incorporate all performing arts genres, including classes dedicated to Indigenous cultural fusion. “And while our programs honour such a rich heritage, we’re focused on preparing students for careers in today’s global performing arts and entertainment industry, exposing them to a wide range of performance scenarios,” he said. ACPA will hold auditions for future dance, acting, music and singing students on Tuesday 25 and Wednesday 26 September 2018 at the Judith Wright Centre of Contemporary Arts in Fortitude Valley, Brisbane. The auditions are open to all aspiring performing artists, including non-Indigenous students, who want to learn from with award-winning teachers and a practical curriculum. “We offer excellent vocational education courses that are industry-relevant, with a strong emphasis on public performances to build confidence and capability,” Dr Kopanakis said. Applications to audition can be downloaded from http://acpa.edu.au/how-to-enrol/. ACPA will also offer auditions in some regional centres between August and October. More information is available on the ACPA website www.acpa.edu.au or by calling 07 3216 1490.